OAKLAND, CA MARCH 13, 2012 Shaffer-Motorsports car #401 won the San Felipe 250 in Class 4 last weekend in Baja, Mexico. After a long week of prerunning and a 24 hour turn around to the US for a rebuilt transaxle, the team made the mad dash to the finish line with only 12 minutes separating them from second. “It was quite a race. 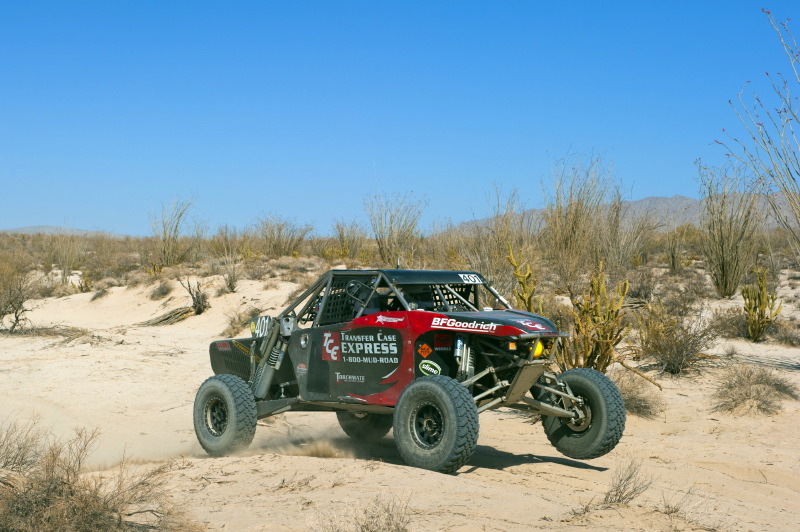 From being down at the half way point, then making a great pass at RM194 for the lead, then watching Daniel put some time on them, we just focused on keeping the sprint up,” said Mike Shaffer, driver of record and owner of Shaffer’s Offroad. The race didn’t come without consequences, as with most desert races. They wound up with three flat tires and four wheels that need some serious attention. But the tolls of the course didn’t stop the drivers Mike Shaffer, Shawn Twitchell and Daniel Aeberli from pushing the Transfer Case Express car to its max and finishing. “All of the drivers and co-drivers are working really well together and you can see the difference at each race as they meld together,” said Shaffer. Prerunning may have been more of an endurance experience than the race itself. During the shock tuning session on Thursday the transaxle gave way. Ron Weddle, from Weddle Industries, invited them to the shop in Southern California to get it fixed. “He showed up at 2:45am in the morning when the guys got there to work and had them back on the road to Baja by 7:30am,” said Shaffer. Within 24 hours the Shaffer-Motorsports crew had diagnosed and fixed the problem, and had the car through tech and ready for the green flag Friday morning! Read more of the Transfer Case Express driver reports on the Shaffer-Motorsports website: http://www.shaffer-motorsports.com. The next race for the Red, White and Black Transfer Case Express car will be the Baja 500 June 1, 2012.